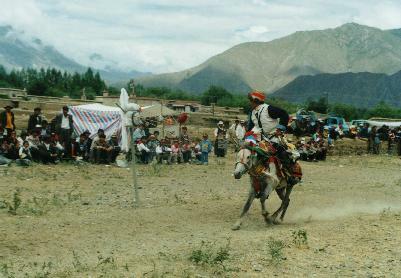 Horseracing and archery, popular all over Southwest China's Tibet autonomous region, began in 1408, when the king of Gyangtse gave a decree marking the period from April 10th through 27th of every year for prayers and a sacrificial ceremony for his grandfather, with entertainment offered on the 28th. By the mid-17th century, the original ritual ceremonies had become symbolic, with horseback archery contests being the most important of festival events. 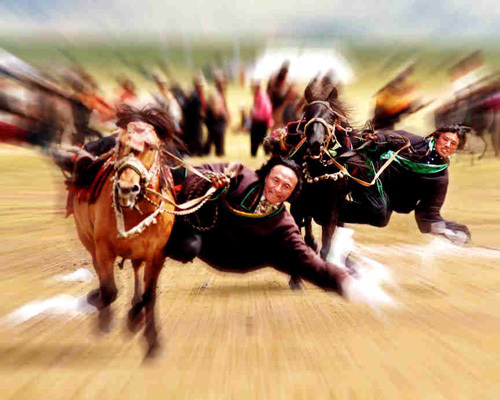 Traditionally, contests include horse races, archery, and shooting on galloping horseback, and so on. 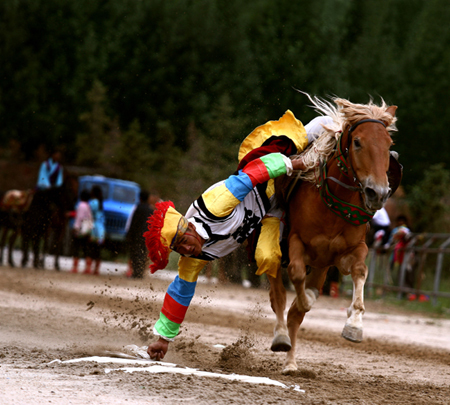 Nowadays, all kinds of entertainment and fairs have been added to this sport game in Tibet. When the race comes around, the racing ground turns into a campsite overnight. Herders attach great importance to the races, and they make preparations well in advance. Among other things, they stop riding their horses to give the animals a chance to rest up. On the coldest day, they bathe the racehorses in icy cold water in the morning. Usually the horses are fed with goat milk, ideally with some crystal sugar added. Before the horse race begins, the horses entered are trimmed with fancy colors. The young jockeys also put on a festive look by donning gaudy silk gowns with matching trousers and accessories like those worn in Tibetan dramas; some even dress in traditional military attire. After circling round the incense burner in the racetrack center, the horses gather at the starting line. There are short and long races, with the long ones covering a distance of three to 10 kilometers. The moment the colorful specks appear in the far distance, a commotion begins in the eager crowds, standing on tiptoes and craning their necks, while a medley of cheers, whistling, catcalls, and laughter floats in the air. The climax comes as the horses sprint to the finish line. The winner receives instant acclaim everywhere. In addition to long- and short-distance horse races, there are horsemanship exhibitions and contests. On horseback, riders pluck scarves from the ground and shoot at targets while at full gallop. Track events include races for children and adults; field events include tug-of-war, jump rope, long jump, high jump, and weight lifting. At some places, there are yak races. While horse racing and archery are popular all over Tibet every year, the most famous are the Nagqu Horseracing Festival and the Gyantse Horseracing & Archery Festival, the latter of which is proudly the oldest such event.